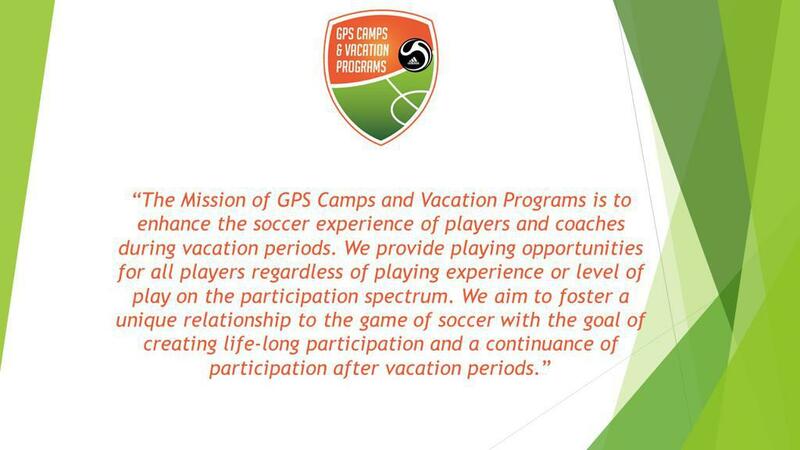 GPS Camps and Vacation Programs is a leading provider of youth camps and clinics in North America and is a department of Global Premier Soccer – one of the largest youth soccer organizations on in North America providing a range of high quality programs that cater to players of all ages and abilities. Our growing reputation as a key proponent of teaching soccer the ‘right’ way has elevated ourselves above countless other youth soccer clubs and programs. Vacation Programs are a fundamental tool in our development plan as they are as beneficial to first time players as much as they are to College players. We aim to provide a range of programming suitable for all levels of playing ability during the vacation periods in an enjoyable yet challenging environment. Delivered by both domestic and international coaches from Great Britain and many other European and South American countries, our ever growing knowledge base continues to drive our goal to provide cutting-edge curriculum and coaching methods. All of this enables us to deliver the best Vacation Program experience possible. Whether you are looking for an introduction to the beautiful game or just want to keep sharp for the new season, we hope to see you at one of our many programs and locations in 2018! GPS has a no-refund policy for all Vacation Programs. The only exception to this policy is in the event GPS cancels a program or a player is unable to attend due to injury. In these situations, registered families will be offered a credit to their GotSoccer account which can be used for any future GPS program, or entitled to a full refund. Where a player is forced to miss a program due to injury a full refund is subject to supporting evidence from a registered medical practitioner.